Last April, CoreCivic Properties formalized a first-of-its-kind agreement with the state of Kansas to replace the 150-year old Lansing Correctional Facility. To put it in perspective, the state built parts of its existing facility around the time Abraham Lincoln received his presidential nomination. Now the Properties team is constructing a brand-new facility with enhanced security and operational technologies. One year after breaking ground, the project is still on target for completion in the first quarter of 2020. This represents one of the Properties team's many innovative solutions for our government partners, backed by more than 35 years of real estate design and development experience. While CoreCivic Properties is quickly strengthening its reputation for real estate expertise, this agreement raised the bar with the team’s proposal to design, build, finance and lease the new 400,000-square-foot Lansing facility – the first to be built and maintained by CoreCivic, yet operated by the state. In the project's early stages, the Properties team listened to the concerns of state corrections leaders who face an ongoing challenge: improving the level of services with less money. The bottom line for the state was the need to provide a safe and secure facility without additional costs to Kansas. In response, Properties delivered a solution that not only provides a new, modern facility; this project will also have a neutral effect on the state budget. "From the start, the Lansing project has been a very collaborative effort,” explained Steven Goraczkowski, CoreCivic managing director of Design and Construction. 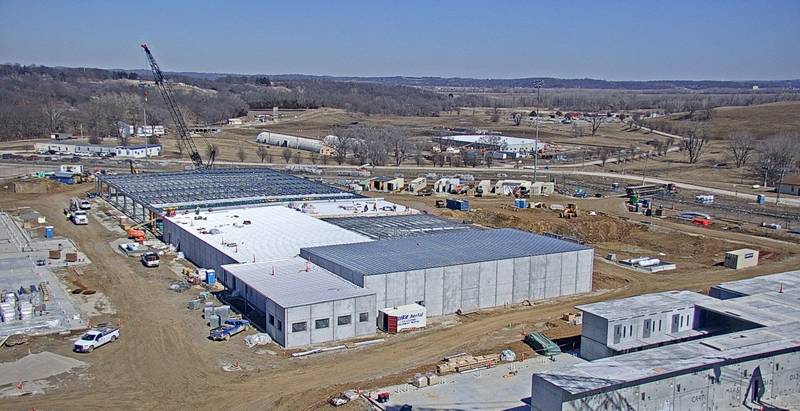 “We knew how important it was to the state of Kansas to create a budget-neutral solution with input from all stakeholders, including the design and construction teams, the Kansas Department of Corrections and CoreCivic." Since construction started, the state has shown consistently strong support. In fact, Kansas government officials were instrumental in developing the project's mission statement: "Transforming historic Lansing with a state-of-the-art correctional facility through an innovative real estate solution and a progressive partnership to better the public good." Construction of the new facility has come a long way since breaking ground last year, and is now over 50 percent complete overall. With all designs and permits in place, construction began in May 2018. The new facility comprises four buildings – two housing units, one 512-bed minimum-security dormitory and one support building that houses medical and food services, recreation, spiritual life and staff support areas. From the start, the design incorporated energy-saving, environmentally friendly features, which also help to minimize operating expenses. For example, the construction crew recycled reinforcement steel and demolished concrete; they were able to repurpose these materials for under-floor fill and underground pipe trenches. The two housing units – totaling 1,920 beds – also achieved significant cost reductions because they incorporate housing modules that were manufactured offsite and shipped to the project. In other words, the furnishings, fixtures, doors, hardware and finishes were pre-installed inside the modules, which helps to shorten the construction schedule. Other cost-saving measures include the use of energy-efficient interior and exterior LED lighting and highly insulated walls to maximize heating and cooling efficiency. So far, Kansas-based contractors have completed over 160,000 man-hours, and are projected to complete a total of 350,000 man-hours. The contractors have worked without any lost-time accidents, a huge accomplishment for any construction project.